One of my many (almost) daily tasks when working on the CodePlex platform since releasing Mercurial as a supported version control system, is converting projects from Team Foundation Server (TFS) to Mercurial. I'm happy to say that of all the conversions I have done since mid-January, the success rate of migrating full source history is about 95%. To get to this success point, I have had to learn and refine several techniques utilizing a few different tools to get the job done. Before I jump into the meat of the post, there are several setup tasks that need to be done first. Once this is saved, you can test if this extension is working by typing the command hg help convert If things are configured correctly, it should display the help information regarding the convert extension. 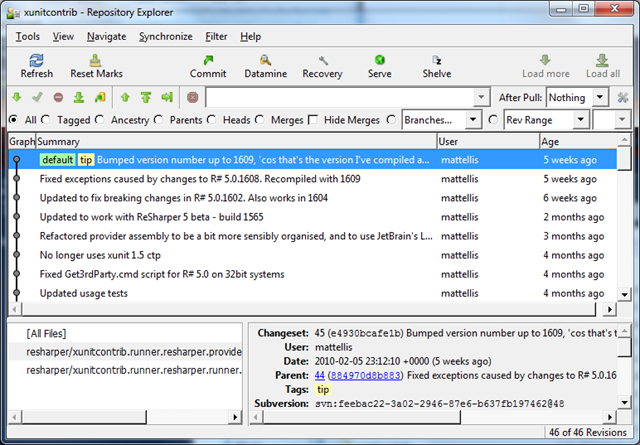 It is only necessary to add username mappings that appear in the TFS source history. Later, you will see how this username mapping file is used. If the conversion works, your project will be successfully converted to Mercurial. It is recommended that you view the log history to ensure everything is in order. Should anyone continue to check in sources, just re-run the conversion on the already-converted Mercurial repository, and it will convert anything new. After you have installed all of these tools (and probably rebooted your machine), follow these steps. Step 1: Create an empty repository in VisualSVN Server. This is where the history from TFS will be migrated to as an intermediary step. Make sure that you do not select Create default structure (trunk, branches, tags). If you accidently check this option your import via tfs2svn will fail because it is expecting an empty repository. 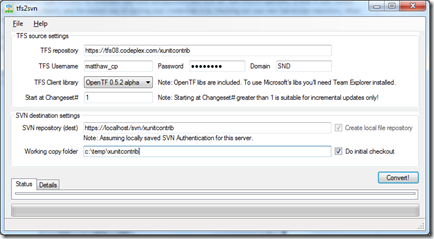 Step 3: You now need to add a user account to VisualSVN server so that tfs2svn can authenticate and import the history. In VisualSVN, right click Users and select Create User. Type in a easy-to-remember username and password and click OK. How tfs2svn operates, is that it uses cached Subversion credentials for the import. The easiest way of caching your credentials, is checking out your new Subversion repository. When prompted for credentials, ensure the checkbox Save Authentication is checked. Step 4: Launch tfs2svn and start filling in the connection information to your TFS and Subversion servers. Once the information is correctly filled out, click the Convert button and wait while it starts extracting the history from TFS and importing it into your Subversion repository. 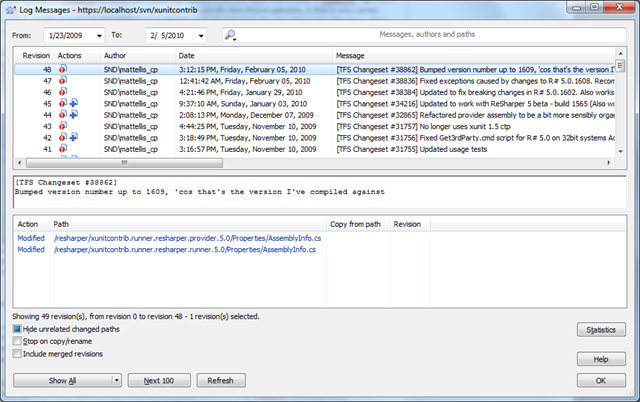 Step 5: Once the tfs2svn process has been completed, you can view the history of the Subversion repository. One thing you'll notice, is that tfs2svn prefixes all commit messages with "[TFS Changeset #12345]". There are also some instances where tfs2svn will add "tfs2svn: " as a commit message as well. If you don't care if your Mercurial repository will have these messages, skip to step 6 - otherwise continue on. 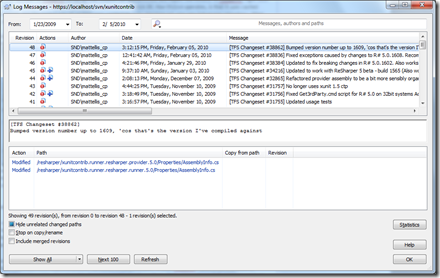 Call the setlog command on the executable svnadmin passing in the path to the temporary file in step 3. Note: If you view the Subversion log again, you may notice that the message for each revision still contains the content we were trying to strip off. If this is the case, don't worry - the history has been rewritten, and you may be viewing a cached version of the repository. 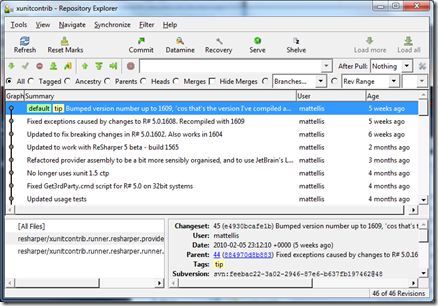 Once completed, you will have a full history of your TFS repository converted to Mercurial! You can now start using your local repository immediately or push the history to a central repository for others to start using. It's been a many months since the last release of WikiPlex, but its only because there hasn't been a lot of churn recently. I've very happy where WikiPlex is at, and it continues to be a very integral part of the CodePlex website! Video Macro - This macro was updated to support Channel9 Videos. This time I did what I promised two releases ago, provided some good documentation. I even went so far as creating another open-source project called WikiMaml which will take wiki syntax and convert it to Sandcastle MAML output. The project isn't full proof, and not where I want it to end up, but it is working great within WikiPlex to generate all of the non-API documentation. As always, if you have any ideas for new macros or extensibility points, please post them in the issue tracker and I'll make sure to look at them! Now, go and download WikiPlex v1.3! This post is long overdue, but as I'm preparing the v1.3 release of WikiPlex and working on documentation (yes, I did say documentation) I realized that another extension point with WikiPlex was not covered. This last, important (but rarely used) part is extending with Scope Augmenters. Scope Augmenters allow you to post process the collection of scopes to further augment, or insert/remove, new scopes prior to being rendered. WikiPlex comes with 3 out-of-the-box Scope Augmenters that it uses for indentation, tables, and lists. For reference, I'll be explaining how and why the IndentationScopeAugmenter was created. As you can see, we're capturing any number of colons at the beginning, but our ending scope knows nothing of the how many defined levels there are. If you can imagine, knowing nothing about your the beginning scope when rendering to correctly render the ending is not a trivial task without context. This is the exact reason a Scope Augmenter is used, it has that context. Scope Augmenters can be as easy as you need to make it, but can also be fairly difficult - point of example, the supplied ListScopeAugmenter requires a complex algorithm to correctly identify levels, nested levels, and determining when to start new lists. When creating a Scope Augmenter, it will take in the associated macro, the current list of scopes, and the current content returning a new list of scopes to be rendered. In your solution, create a class called IndentationScopeAugmenter and extend it from WikIPlex.Parsing.IScopeAugmenter. You'll then implement the Augment method. When you call the WikiEngine.Render("content"), it will automatically pick up all registered Scope Augmenters and use them during parsing. You now have a fully functioning macro / augmenter / renderer that will take an arbitrary depth and have it render correctly. As previously stated, WikiPlex also ships two other Scope Augmenters, ListScopeAugmenter and TableScopeAugmenter, which have a bit more logic associated with them. While Scope Augmenters allow you to manipulate the list of scopes prior to rendering, they should only be used in certain situations in which you cannot capture the correct set of conditions or are unable to contextually determine rendering based on separate scopes.